A mutual fund's net asset value (NAV) (the net value of all assets within the mutual fund's portfolio divided by the number of outstanding shares) should be identical to its market price, but often, the market price of a closed-end mutual fund (a fund with a fixed number of issued shares that can't be altered) will trade either above or / below its NAV - Net Asset Value. When this situation occurs & the mutual fund is trading above this price, it is said to be trading at a premium; conversely, when the mutual fund is trading below this price, it is said to be trading at a discount. 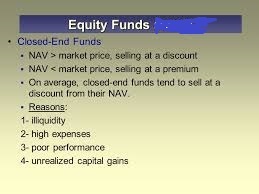 and - the fundamentals of supply and demand will adjust the trading price of a mutual fund compared to its NAV. 1. If the fund is in high demand & low supply, the market price will typically exceed the NAV. 2. If there is low demand & much supply, the market price will usually be lower than the NAV. 3. Another reason why there may be a price deviation between the NAV and market price is the management team responsible for the fund itself. 4. Sometimes, if the manager is highly regarded, a premium will be paid by investors wishing to hold the fund. 5. 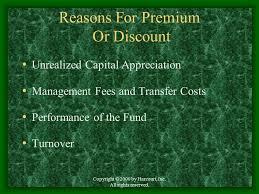 If the management is not as highly regarded, the fund may trade at a discount. 7. while those with assets expected to perform poorly may sell at a discount.